Centric Air 4.0 Whole House Fan 3921 CFM (HVI-916) up to 4400 SQ. FT.
CentricAir 4.0 whole house fan delivers a powerful 3921 CFM (HVI-916). It requires about 5.0 sq. ft. of net free attic ventilation and costs about $0.08 per hour to operate. It uses 623 WATTS of power and is designed to cool 2-story homes up to 4400 sq. ft. and 1-story homes up to 3000 sq. ft.
CentricAir whole house fans consist of a German engineered fan motor which is 30% more powerful and uses 1/3 less electricity than other whole house fan motors. These high efficient motors come with a 15-year guarantee and are rated for 40,000 hours of operation. Industrial grade gravity fed back draft damper requires no power and now comes with all CentricAir whole house fans. The gravity damper is designed keep attic air from entering the living space when the whole house fan is not in use. Our Wireless Single speed remote control is available for FREE with all CentricAir whole house fans. It allows you to operate the fan up to 100 feet away. 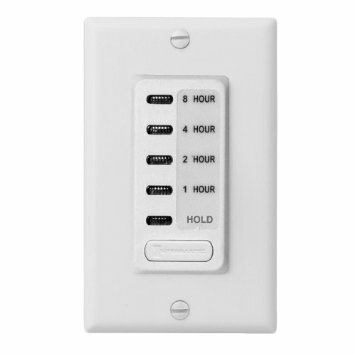 Make your whole house fan more convenient to use and eliminate the need to cut holes and run wires down the wall with a wireless remote control. The Single Speed Timer allows you to operate the fan on high speed and also choose how long to run your fan (1, 2, 4, 8 hours or HOLD). 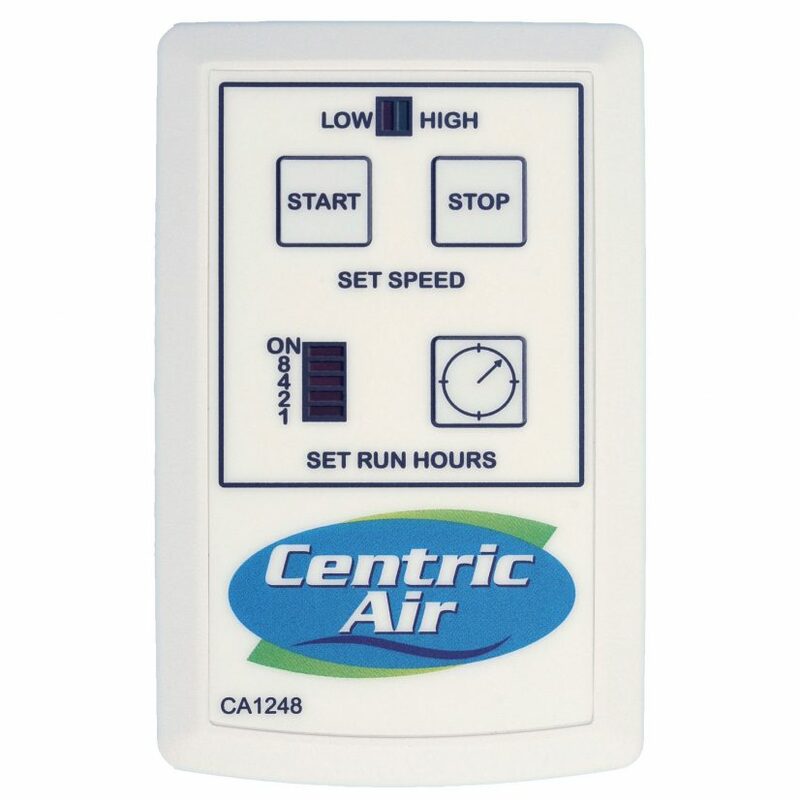 The CentricAir model CA1248 is a wireless two speed remote control with timer. It features an LED display so you can clearly see what speed your whole house fan is set to (HI/LOW) and how many hours (1, 2, 4, 8 hours or ON) it is set to run. 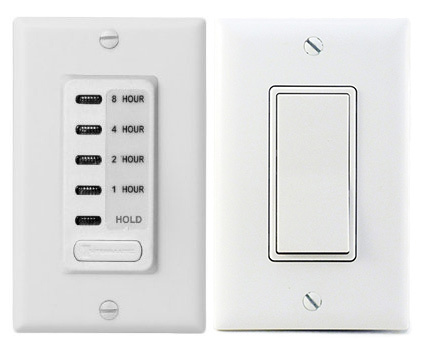 Our wall mounted two speed switch & timer lets you set the speed of your fan and choose when it will shut off. 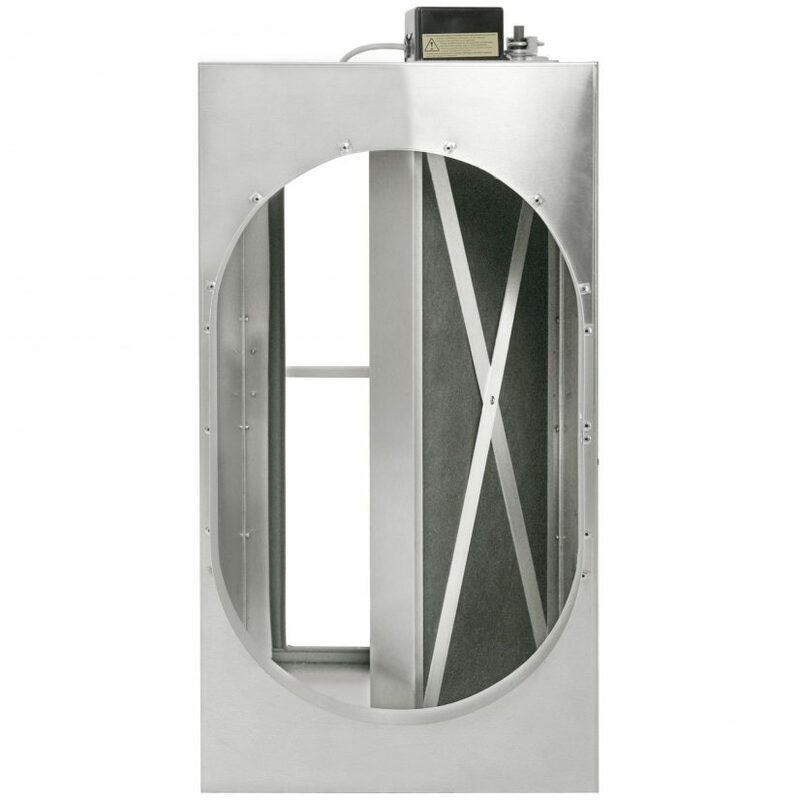 Designed for cold climates, the Cold Climate Damper (available with 2.7, 3.4, & 4.0 models only) is powered by a heavy-duty actuator that is tested to 60,000 cycles. 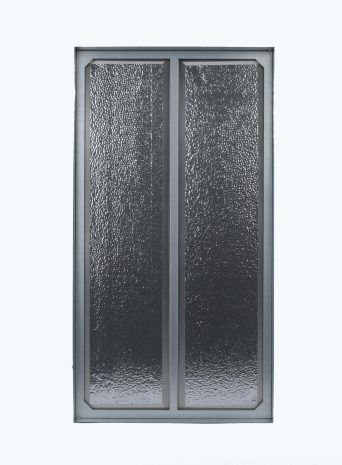 The damper door is insulated to R-10, (upgradable to R-50), to help ensure an air tight seal whenever your whole house fan is not in use. The damper can be installed vertically or horizontally. Grille Size (outer): 16" x 30"
Rough Opening: 14" × 28"
Warranty: 20 year limited fan motor warranty. All other components and electrical parts are warranted for 1 year from date of purchase. Warranty excludes batteries. Exceptional Power, Extremely Energy Efficient! The Centric Air 4.0 is a high quality, very powerful and ultra quiet alternative cooling solution. It uses a German engineered industrial grade fan motor that can provide 30% more power while using 1/3 less energy as compared to other industry standard fans. These high-end industrial grade motors are built to last and are rated for approximately 40,000 hours of operation. The noise level is also really something to hear – or, actually not hear. At a very quiet 54 dBA on high, the 4.0 is very quiet. Every aspect of this system is built to a rigorous specification suitable to demanding industrial applications and is completely maintenance free. 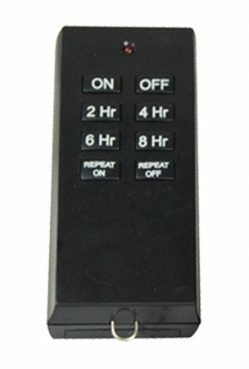 The optional two speed remote control with timer is our most versatile control which features an LED display and 5 Timer Functions 1, 2, 4, 8 hours or ON. On high speed the system operates at a powerful 3860 CFM. Set to low speed the system provides a comfortable flow of air while maintaining a whisper quiet noise level. A fundamental problem with traditional whole house fans was air leakage between the attic and living spaces. This could result in dirty attic air entering your home. The 4.0 takes care of this problem with an industrial-quality damper that is thermally insulated and maintenance free. Silicone seals are provided to ensure sealing longevity; they also provide phenomenal resistance to weathering and changes in temperature. Silicone seals have an approximate service life of 30 years and remain flexible down to -40 degrees F/C. The Centric Air 4.0 comes with a high air flow register that reduces air movement noise through the register. These high-performance grills look great too, so your system looks as inconspicuous as it sounds. The German-engineered sealed motor and damper never requires lubrication or maintenance of any type. Find out why Centric Air has a better whole house fan. We can't thank you enough for our incredible new Centric Air Whole House Fan. It's amazing how quiet, yet effective it is. Friends of ours have a whole house fan that sounds like a Train running by the house. We can hardly hear our unit running. But the best part is it's unbelievable how cool our house is. Last night my kids actually used their blankets to cover up all night. Not something we normally see. I typically have 2 fans and a window A/C unit on in our master bedroom just so I can sleep. Not anymore. Now I just open the windows, let the Centric Air unit do its job and the natural air from outside cools the house down just as though we had A/C going all night. I can't wait to tell our friends about your product ...it's just what my family has been looking for to ease those hot, sticky days & nights. Our Centric Air fan does a really good job of cooling off our house. Where we live it usually cools off in the evening which is when the fan excels. It pulls in the cool evening air and pushes out the hot air. The installation was quick and the crew left everything spotless when they were done. It also does a good job of clearing the air if dinner gets burned! Had the 4.0 installed last week. What amazing product. So happy we have made the decision to purchase and install in our home. The ease of cooling the second floor from no fan to the whole house fan is night and day! Great start to a cooler night. Thank you!! We had a Centric Air 4.0 installed last year. We have used it every month. In the winter on warm days to draw in warmer outside air and every night during the summer. The fan really work and you can barely hear it. We run them all night long. Not only are we really satisfied, we were really impressed with the installer. At his suggestion we added extra vents. With the fan running the attic cools down in the evening keeping the house cool during the day. One more thing. Our electric bills this summer are way down. I did a lot of comparison shopping on the internet and talked to friends with fans. This one is by far the best, even though a little more expensive. Great product!! I live in the Ceres, California where it reaches 100 degrees regularly. After using your WHF 4.0 in my home for (1) month. My energy usage went from 2409 kwh for this billing period in 2013. To 1450 kwh in 2014. That relates to nearly $140.00 saving where I live. I only ran my A/C once the entire month. There was a couple times in the month that my home became uncomfortable. But my iPhone said the temperature was coming down in an hour or two. So family suffered for a little here and there. But it’s funny to have to shut off the system at night because my family is freezing. Best purchase I have made in years for my home. Thanks for the great product. Purchased this quiet whole house fan for a client, installed it last summer. All I can say is WOW… This fan is so quiet I had to get back up on the ladder and stick my head up there to make sure it was actually running. Compared to the old school belt driven fan that was ugly, noisy, dirtying and drafty, there is no comparison. The build quality of this unit was impressive, now I’m going to be getting one for my own home! Installation is very straightforward, took longer to muscle the old fan out of the attic then it did to install this. Even though I am a contractor, I would say a weekend warrior, or average DIY should have no trouble installing. Instructions are clear and easy to follow, and presale support was excellent, I had no need to contact them after the sale as it was so easy to install. I would imagine their support to be excellent given they have quick and friendly communication. If you are on the fence and shopping your local home improvement stores, do yourself a favor and stop looking. Yes, the unit is pricey compared to the junk local stores sell, but the quality, energy efficiency and lack of noise are WELL worth the cost! I have had Whole House Fans in all my past homes but they were both noisy and energy gobblers. The Centic Air is the quietest and most energy efficient whole house fan that I have had. Love the 2-Speed remote and the R-50 damper since I live in Colorado. 5-Stars thumbs up!! I had a Quiet Cool fan and I was not happy with it and change to a CentricAir. The CentricAir is quieter and more energy efficient. The German motor and composite balanced 5 blade system in the best.